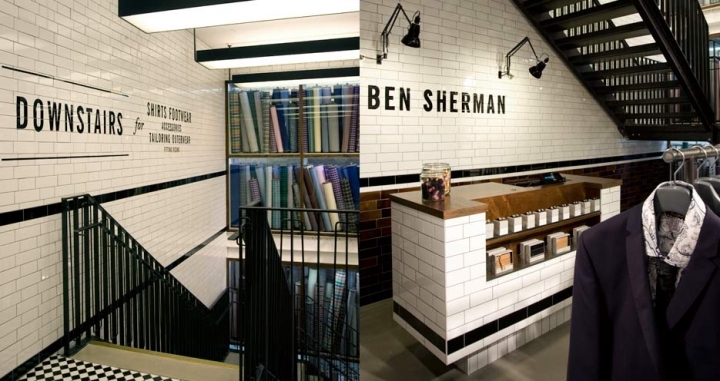 Brinkworth have created a new international retail concept for Ben Sherman, including standalone stores, mall stores and concessions. 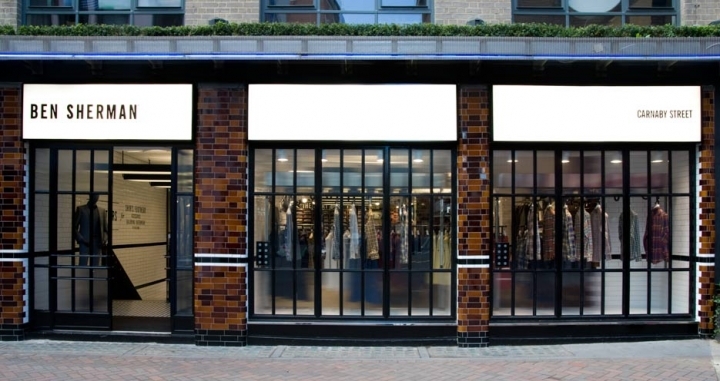 The first of this extensive rollout is situated on London’s Carnaby Street, with a unique, premium boutique store to follow shortly after on Portobello Road. Briefed to build on the brands heritage of modernism and to emphasize Ben Sherman’s authority in shirting, Brinkworth have worked closely with the Ben Sherman creative team to produce a store concept which references icons of British design, such as our traditional pubs and the London Underground, to create a fresh environment and showcase the Ben Sherman collection. Taking reference from the Victorian warehouses and workspaces around the Ben Sherman HQ in the EC1 area of London, the Carnaby Street frontage features striking, teapot brown glazed bricks and utilitarian black and white tiles. 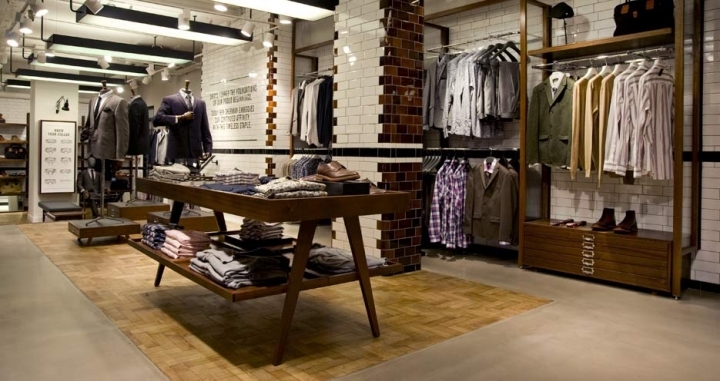 The main feature however, is a dynamic interactive window display, which represents Ben Sherman’s commitment to the quality of their core product – the shirt. The pneumatically controlled, moving rail system, selects a specific shirt and enables the viewer to examine it in detail from all angles. Reeded glass has been used around the display to offer a diffused view into the store, while creating a window of clear glass to highlight the rail system. Internally, the aesthetic continues – concrete flooring is used throughout, with a reclaimed oak parquet floor used to highlight specific areas. Walls are covered in authentic glazed Victorian tiles, complete with moulded dado rails, curved corner pieces, and the iconic teapot brown glazed bricks. This limited material and colour palette establishes a strong brand character, creating a muted backdrop on which to display the collection. 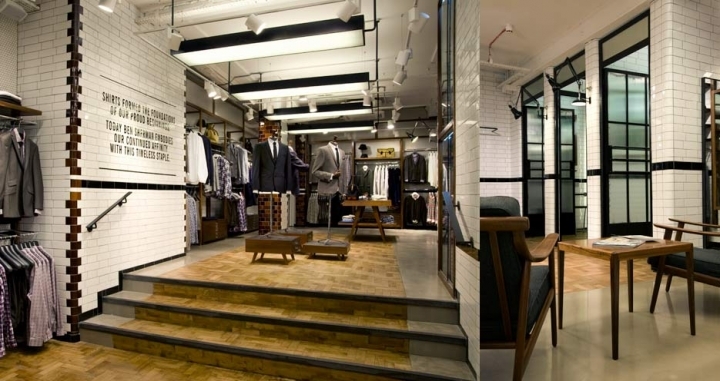 At the top of the stairs, a wall created from rolls of original Ben Sherman fabric behind glass, highlights the heritage of the brand and adds pattern and colour to the interior. 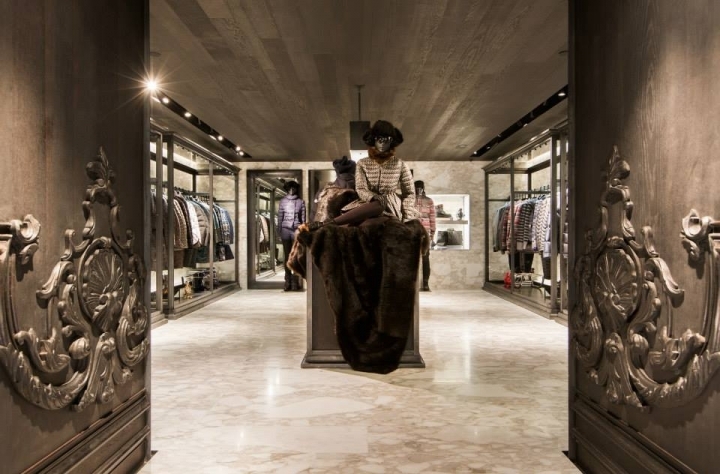 This is repeated around the fitting rooms in the basement, which are dedicated to displaying formal-wear and utilise the materials and finishes used on the ground floor. Taking design cues from British mid-century furniture, the bespoke display units are traditionally crafted to mirror the detailing in the clothing. 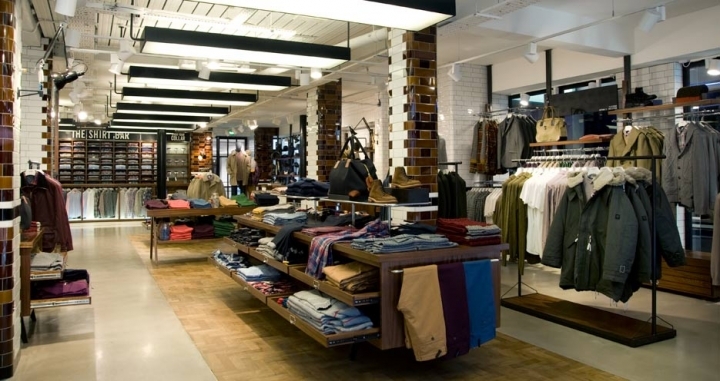 Shelving and hanging rails all provide maximum flexibility for varied lifestyle visual merchandising, while mid-floor pieces create product focus points. 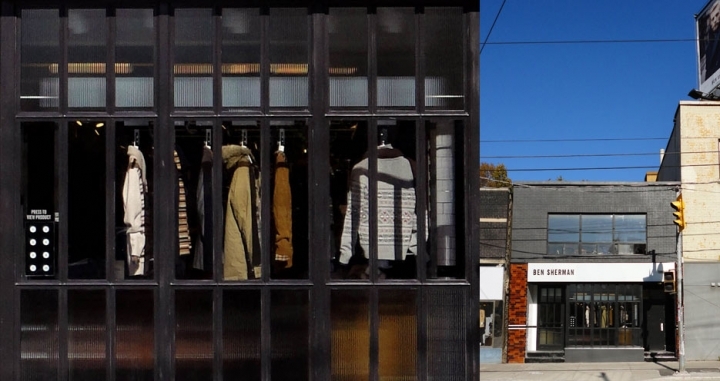 Bespoke architectural light-boxes form a pathway to the rear of the store, where the main focal area and centrepiece of the store is situated – the Shirt Bar. 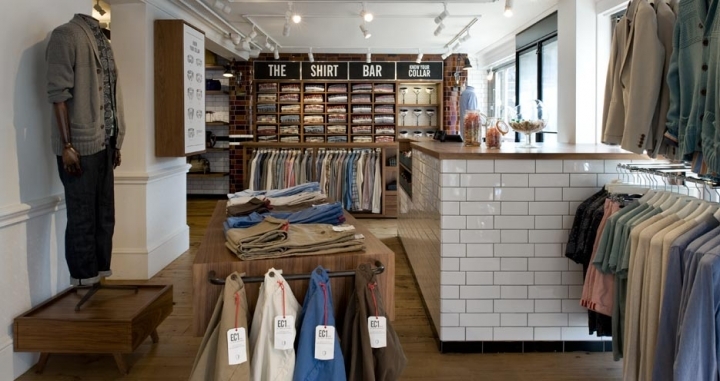 Dedicated to shirting and designed as an opportunity for the brand to showcase its breadth of knowledge in every aspect of shirting, the emphasis is on sales and service, fitting and care. 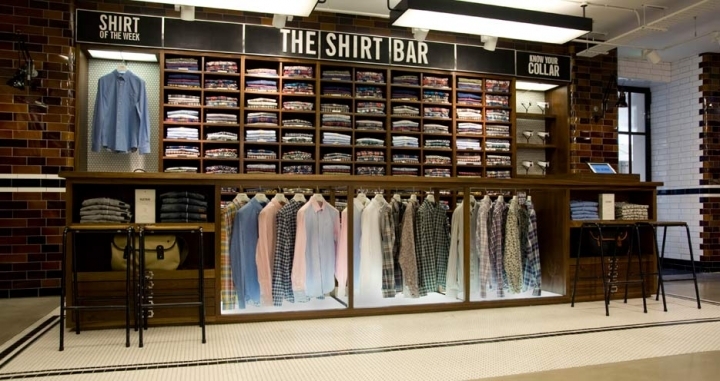 Comprised of a rich and abundant wall display and an under-lit mid-floor counter, the Shirt Bar offers the customer an immersive brand experience. 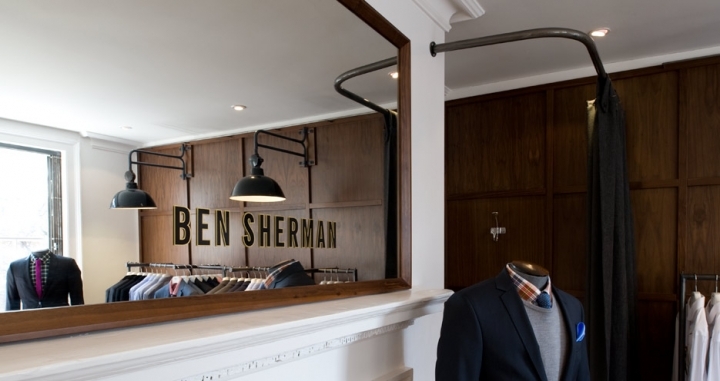 Brinkworth Associate Director Murray Aitken says: “we’ve worked closely with the Ben Sherman team to ensure the depth of product story is conveyed through to their customer. 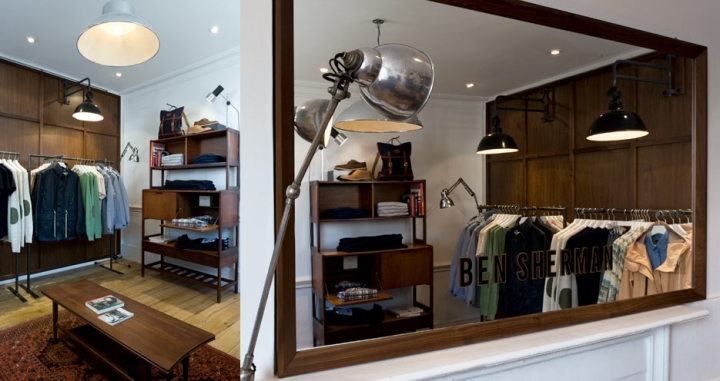 As well as the great British heritage of the brand, we wanted our scheme to reflect the time, effort, commitment and detail that is inherent in a Ben Sherman product. The environment we’ve produced as a result, combines authentic British materials and references, with clean modern design language that directly reflects, complements and supports Ben Sherman’s new product ranges”. 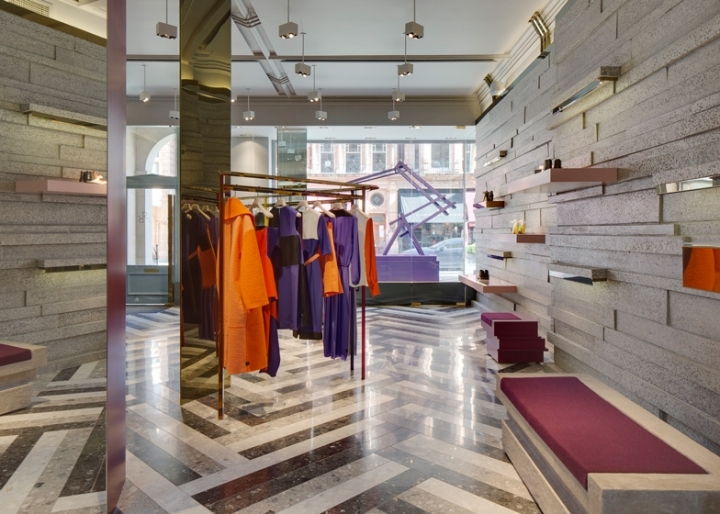 Brinkworth is one of the UK’s leading creative retail design agencies, specialising in creative brand strategy and interior, graphic, architectural and environmental design. Established by Adam Brinkworth in 1990 the company has been responsible for the commercial success of many premier global fashion and retail brands, and for launching many of the high street‚s most contemporary store designs, both within the UK and internationally.